In a large bowl, mix all ingredients except the oil. Use your hands to mix it well then roll out meatballs. You can make them small or large. I prefer mini-meatballs, about an ounce per ball (16 in a pound). In a large skillet heat coconut oil on medium-high heat. Once oil is very hot, put in the meatballs. Try not to move the balls. Cook for 3-4 minutes, then flip and cook for another 3-4 minutes. If you’ve made bigger balls you may need to cook longer or cover the meatballs during the cooking process. Once both sides are browned and balls are cooked through, serve them up however you like! This can make a great main dish with spaghetti squash or wraps, or a great appetizer using tooth picks. The Tahini sauce contains yogurt so it is not “Paleo.” However, many people make an exception for Greek Yogurt and some other dairy products. If you’re one of these Paleo+ people, you’ll enjoy this flavor-packed sauce and dip. Simply mix the above ingredients and enjoy. A little goes a longgg way. I like it as a tasty addition to the meatballs. Brings back memories of delicious felafels and shawarmas I ate while traveling. You can play around with this basic tahini sauce, adding in your favorite herbs/spices to make it your own. Prepare through Step 2 and refrigerate for up to 4 hours. Combine water and 1 tablespoon salt in a large saucepan; bring to a boil over high heat. Add shrimp and immediately turn off the heat. Let the shrimp sit until just cooked through, about 3 minutes. Transfer to a cutting board until cool enough to handle, about 10 minutes. Chop the shrimp into 1/2-inch pieces and place in a medium nonreactive bowl. Add lemon, lime and orange juice. Stir in cucumber, onion and chiles. Refrigerate for at least 1 hour, up to 4 hours. Mix flour and salt together by pulsing in a food processor a couple of times. Add the coconut oil and egg. Pulse to blend until the dough forms a ball. Spread the dough out evenly in in a pie plate leaving 1/3 inch from the rim. Dice and fry the bacon on medium heat. 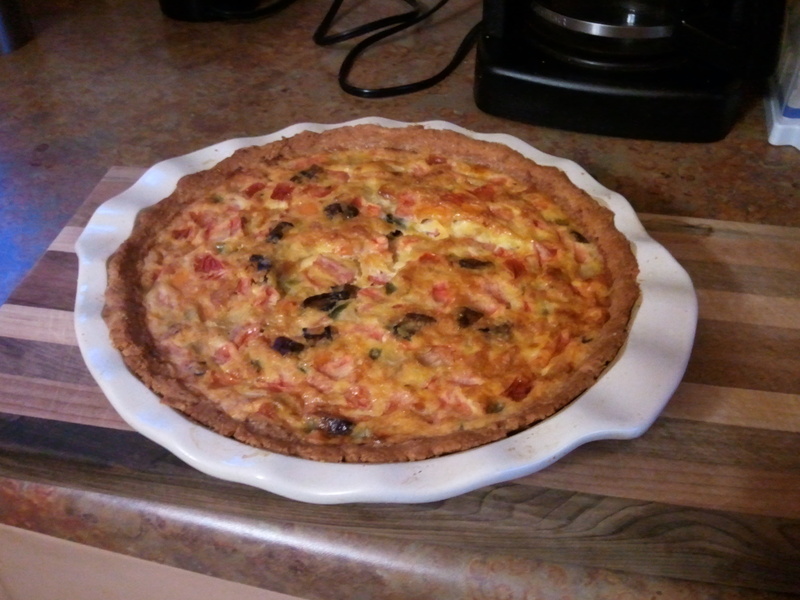 While the bacon is fryig dice the onion, mushroom and peppers. Add those to the bacon and saute until the onions and peppers are tender (almost carmalized). Set aside. Seed and dice the tomatoes. Mix eggs, splash of water and salt in the food processor until eggs are fully blended. Stir in the bacon and vegetable mix. Pour into pie shell. Bake at 350 for 35-40 minute or until knife comes out clean. Pre heat oven to 350. Slice the egg plant (peeled) and zucchini in 3/8 inch (long) slices. Coat with olive oil, salt and pepper. Roast in oven for 20 minutes. An option is to slice sweet peppers and roast them with the egg plant and zucchini…yellow peppers add a bit of color. While the veges are roasting prepare the sauce. Brown the hamburger and sausage together. Remove excess fat. Add the carrots, onion, pepper and garlic to the meat. Saute until the onions and peppers are tender. Add the tomato paste and tomatoes. Salt and pepper to taste. Add the basil and thyme to taste. You can use italian seasoning instead of the fresh spices. The sauce should be thick, so simmer to reduce until it reaches the desired consistency. It usually takes 20-30 minutes to finish the sauce. In a large casserole pan coat the bottom with the sauce. Layer the egg plant, sauce and zucchini in the pan. Repeat. If desired, add a small amount (no more than 2-3 tablespoons) of crumbled goat cheese, sprinkled on the middle and top layers, to add a little zip. Finish with a layer of sauce. Bake in the oven on 350 for 30 minutes. Fry bacon until crisp. Remove from stove. Cook cubed chicken in leftover bacon fat. Throw everything into your crockpot and cook on low 6-8 hours. Feel free to add mushrooms or other veggies are good additions too! 1. Preheat oven to 400°F. 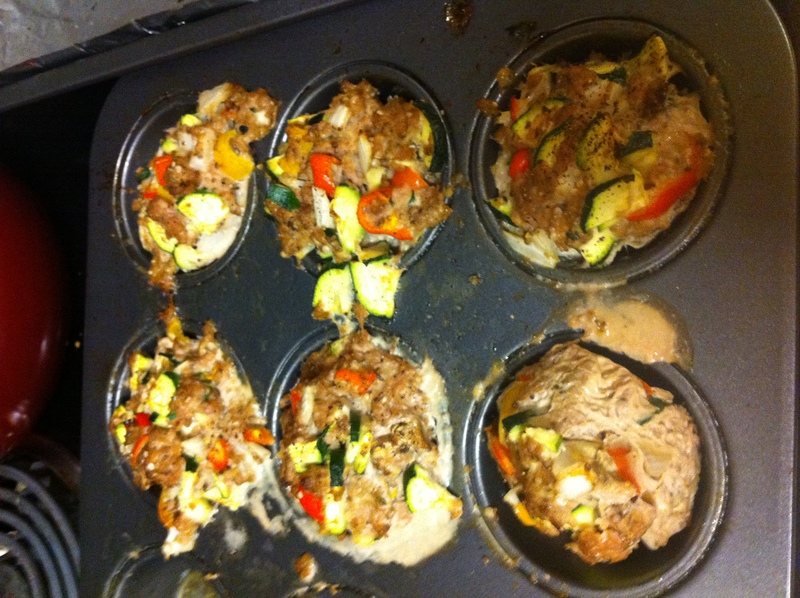 Generously spray a nonstick muffin pan with olive oil cooking spray. Makes 6 servings, 2 loaves each. Other optional veggies: spinach, cauliflower, mushrooms, etc. Cook bacon in pan until it gets lightly crispy. Add all veggies except for tomatoes, garlic, and spices and saute until crisp done. Cut squash in half and scoop out seeds and gunk. Brush with olive oil and dust with salt and pepper. Pre-heat oven to 400 degrees F. Bake Squash for 15 minutes cut side up. Mix bacon/ veggie mixture with remaining ingredients (including bacon grease!) 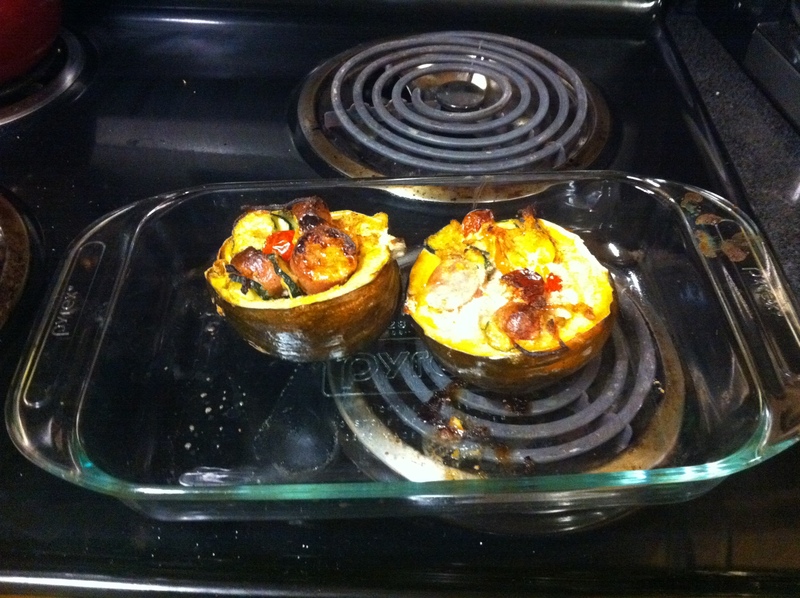 in a large bowl and scoop into acorn squash. Bake for 45 minutes covered with aluminum foil. Remove aluminum foil and bake for an additional 15 minutes.